There is going to be a change to the Fall Schedule for the 2017-18 prime season on Tuesday and Thursday nights for NBC. This Is Us will now remain on Tuesdays and not move to Thursdays, while Thursdays will now feature the return of a four-comedy night from 8-10pm. The new schedule is below and all the other nights will remain the same as announced two weeks ago. 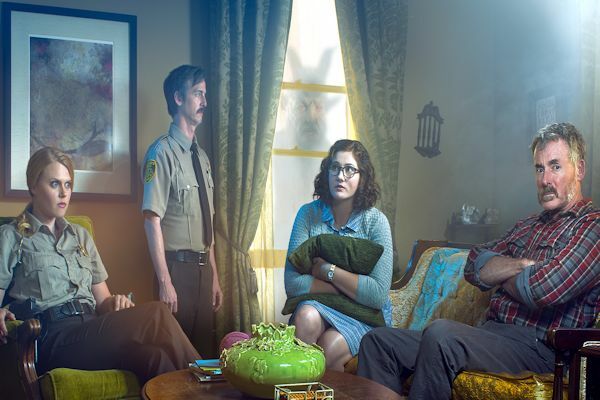 Production has commenced in Atlanta, GA for IFC's Stan Against Evil, with returning leads John C. McGinley (Scrubs) as Stan Miller, the curmudgeonly retired police-sheriff, and Janet Varney (You're The Worst) as Evie Barret, the current sheriff in Willard's Mill determined to wipe out the demons that plague their quaint New England town. Stan Against Evil is created by Dana Gould (The Simpsons, Parks and Recreation) and produced by RadicalMedia (MARS, Abstract: The Art of Design). Season 2 of the horror-comedy series will premiere this fall on IFC with eight half-hour episodes. · Denise Boutte (Meet The Browns) as Lara Bouchard, a local who may know more about the town's demonic creatures than she lets on. · Jeffrey Combs (Gotham) as the Impish Man, a Willard's Mill newcomer who loves nothing more than a good bet. · David Koechner (Anchorman) as Kenny, Evie's incorrigible ex-husband who, to Evie's dismay, creates a friendship with Stan. · Steven Ogg (The Walking Dead) as Rusty, a cowboy from the past who takes a particular liking to Evie. · Patty McCormack (The Bad Seed) as Priscilla, the knowledgeable owner of an antiques store. The new season picks up where the Season 1 finale cliffhanger left off, with Sheriff Evie Barret (Varney) stranded in the year 1692, accused of being a witch and about to be burned at the stake. Despite his best attempts to never leave his couch, the disgruntled Stan Miller (McGinley) must begrudgingly solve the mystery of Evie's time-travelling disappearance. Throughout the season, the unlikely team will continue to battle against the unconventional demons trying to take over their town, which continue to pop up in every size, shape, and animal-form. Deborah Baker Jr. (The Great Indoors) and Nate Mooney (It's Always Sunny in Philadelphia) also return to co-star as Denise Miller, Stan's absent-minded, do-good daughter, and Deputy Leon Drinkwater, Evie's right hand man, respectively. Bravo Media's original scripted comedy series Odd Mom Out, starring Jill Kargman, Abby Elliott, Andy Buckley, KK Glick, Sean Kleier, and Joanna Cassidy returns for season three on Wednesday, July 12 at 10 pm ET/PT. The series is created by Kargman, who plays a satirical version of herself trying to coexist with the demanding hierarchy of New York's exclusive Upper East Side mommy clique. This season, as victims of Ernie Krevitt's Ponzi scheme grapple with their new financial reality, Jill juggles the demands of her relentless mother-in-law and hormonal tweenage daughter while struggling with her own desires to feel young and relevant. Odd Mom Out season two delivered 1.1 million total viewers, up +5% above the prior season, making it one of the few returning ad-supported scripted series that saw growth in 2016. Watch a sneak peek of this season. Joining the cast this season is Christine Taylor (Search Party, Dodgeball) playing Brooke's older sister, Barrett, a perfectionist homemaker who could make Martha Stewart look like a slob; Meredith Hagner (Search Party, The Set up) as Brooke's younger sister, who has mastered the art of cloying condescension; Alysia Reiner (Better Things, OITNB) as a by-the-book prosecutor trying the murder case of the century; Emma Myles (OITNB, Law & Order: SVU) as a crystal-wearing Wiccan whose testimony shocks the nation in said murder trial; and Dan Butler (Frasier, The Mist) playing Joe, a man who drops some serious knowledge on a lost Lex. Additionally, this season features notable guest stars Dave Navarro (Ink Master, Jane's Addiction) playing himself - paying off an epic night for Jill and Vanessa - and Wendy Williams (Host, The Wendy Williams Show) playing herself landing an exclusive interview with someone from the von Webers' past bent on taking down the family by spilling more tea than the Boston Tea Party. This season, while the UES one-percenters find themselves in financial "distress," Candace seeks refuge by moving in with Jill and Andy, turning their lives upside down. Jill struggles to deal with how fast her daughter is growing up and launching her photography career, but she reaches a breaking point, making a surprising decision that has repercussions for Candace. Andy gets involved in school committees for the kids and takes on more than he can chew. Just when Candace is starting to get comfortable in Jill's home, she is sequestered for a murder case, and in true Candace fashion, she turns jury duty into her playpen. Brooke becomes the breadwinner of her family, but as she attempts to expand her empire, a former employee goes rogue, threatening everything she has accomplished. Meanwhile, the ripple effects of the Ponzi scheme cause Lex to consider a new career that is out of this world. And Vanessa tries to be a constant support for Jill while challenged with getting out of her comfort zone to try to keep the flames alive with her ex-husband Graham. The long weekend just finished. ICYMI, soak up all of the immature use of mature language in four all new NSFW sneak peeks at from Friends from College the new Netflix original comedy series premiering globally on July 14. A group of friends from Harvard played by Keegan-Michael Key (Ethan), Cobie Smulders (Lisa), Annie Parisse (Sam), Nat Faxon (Nick), Fred Savage (Max) and Jae Suh Park (Marianne) are facing down their forties. With interwoven and oftentimes complicated relationships with one another. Friends from College is a comedic exploration of old friendships, former romantic entanglements and balancing adult life with nostalgia for the past. The series is executive produced by Nicholas Stoller (Neighbors, Neighbors: Sorority Rising, Forgetting Sarah Marshall, Get Him to the Greek), who also directed all eight episodes. Francesca Delbanco serves as an EP and writer. Happy Memorial Day! As usual, we have the holiday marathons on a holiday for you! As we pay tribute to our troops every year on this day, let's have some fun as well watching TV marathons on the tube on this day off! If you're not going outside in the heat, then there are plenty of TV options for you on this day! Are you headed to the shore or would you rather watch some good TV marathons like The Incredible Hulk? Swim into summer! So bring out your lawn chair, throw some burgers on the BBQ, and watch some television! Among the marathons today are the marathons we have previously mentioned, such as the Gidget marathon on Antenna TV today from 6am-10pm. Comedy Central has a Scrubs marathon that starts at 6am ET/PT, as series star Zach Braff will be tweeting throughout the day to celebrate. FXX has a marathon of The Simpsons from 6pm-12am. Sundance TV will have the ultimate Memorial Day marathon with a M*A*S*H marathon all day today running through 6am Tuesday. TV Land thanks you for being a friend as they have a marathon of The Golden Girls from 9am to 4pm. USA Network has a Chrisley Knows Best marathon from 6am-8pm. Centric has a marathon of The Soul Man all day today through 6:30pm. That '70s Show marathon airs on IFC from 6am-12pm. MTV2 has a Wayans Bros. marathon from 9am-10pm. Other sitcoms airing today will be in their regular blocks or stacks, like Three's Company, The Facts of Life and Alice on Logo. Moving on to dramas, El Rey Network launches The Incredible Hulk with a marathon that has aired this weekend and concludes tomorrow at 5am. Pop will have an ER "Carol and Doug" marathon beginning at 9am and ending at 6pm. TV One has an Empire Memorial Day marathon today from 7am-1am. INSP has a Big Valley marathon from 7am-1pm. ION will have a marathon of Blue Bloods again this year from 9am-1am. Other notable marathons include Nashville catch-up marathon on CMT from 9am-8pm, as the season continues this Thursday at 9pm. WE tv has a CSI: Miami marathon from 2pm-4am. BBC America will have a Star Trek: Voyager marathon that will run 24 hours beginning at 6am. OWN will have a Queen Sugar marathon from 2pm-3am. Reelz's has a Kennedys marathon. Reality series wise, WGN America has a Cops marathon from 12pm-8pm. CNBC has a Shark Tank marathon from 12-9pm. Esquire will showcase Knife Fight with a marathon from 12pm-10mm. Other reality best bets for the day are Impractical Jokers marathon on truTV, Southern Charm marathon on Bravo from 1-11pm, Bizarre Foods marathon on Travel Channel from 8am-4am, Dr. Phil on OWN from 5am-2pm, Beachfront Bargain Hunt marathon on HGTV from 7am-1pm, T.I. and Tiny: The Family Hustle marathon on VH1 and Say Yes to the Dress marathon on TLC from 7am-7pm. History has a American Pickers marathon. Oxygen has a Snapped marathon all day. And A&E has a Leah Remini: Scientology and The Aftermath marathon. If you like movies on TV, watch the Harry Potter movie marathon on Freeform, The Hobbit on TNT, and Final Destination on IFC. And you can of course catch movies all day on Lifetime, LMN, FX, Syfy, AMC, TCM, TBS, MTV, E!, Spike and other networks that usually air movies. Enjoy!! Households: #1. ABC 4.82/9 rating/share (+33% in rating from first four nights week 35); #2. CBS 4.26/8 (-3%); #3. NBC 4.25/8 (+14%); #4. Fox 2.10/4 (+1%); #5. The CW 0.99/2 (+8%). Total Viewers: #1. ABC 7.413 million (+33% from first four nights week 35); #2. NBC 6.774 million (+15%); #3. CBS 6.770 million (-3%); #4. Fox 3.316 million (+2%); #5. The CW 1.623 million (+11%). We have previous week's final ratings, Week 35 (5/15/17-5/21/17, LIVE+SD). ABC won the week in A18-49 and did a 1.19 rating. NBC was #2 with a 0.98 rating. CBS was #3 with a 0.84 rating, while Fox was #4 with a 0.78 rating. Among total viewers, CBS was #1 with 6.035 million, with ABC #2 at 5.114 million. NBC was #3 with 4.923 million and Fox at #4 with 2.572 million. For the final season (9/19/16-5/24/17, LIVE+SD) numbers, NBC was 1 in A18-49 with a 1.66 rating, followed by Fox at #2 with a 1.52 rating thanks to the Super Bowl and also heavily inflated by a high 7-game World Series. Without those 2 events, Fox would be #4. CBS was #3 with a 1.40 rating and ABC was at #4 with a 1.19 rating. Among total viewers CBS was #1 at 7.963 million, followed by NBC at #2 with 6.749 million. ABC jumped by Fox for #3 with 4.991 million as Fox settled for #4 with 4.909 million. ABC will have a bigger lead when final Live+7 figures are out.